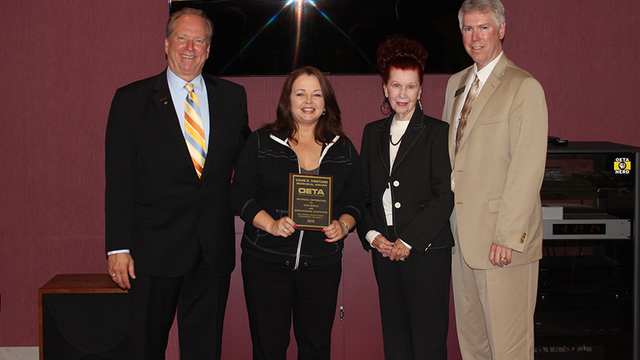 Given annually to the OETA staff member who has done the most to enhance interdivisional cooperation and to boost morale, the 2015 Louis R. Vineyard Award was presented to Susan Miller. An award-winning journalist, Miller began her career in broadcasting in 1989 in Oklahoma City. After a brief stint in Tennessee, she returned to the Sooner State and began her tenure at OETA in 2000. Miller has worked for two documentary programs, Stateline and Gallery and has won several awards including four Heartland Regional Emmys, a Best of the Best award from the National Educational Telecommunications Association, and a first place award from the National Women in Communications organization. Miller volunteers at her church, has two grown children who both live in Oklahoma City, two dogs, a Great Dane and a Chihuahua, and a convertible that she swears "keeps her sane." The award was presented during a ceremony in the Vineyard Center (named for Louis Vineyard's father and long-time OETA board member the late Dr. Edwin Vineyard) by OETA Executive Director Dan Schiedel, Louis' mother Imogene Vineyard and brother Dr. Ed Vineyard. A plaque at the station permanently displays the names of annual recipients. The Louis R. Vineyard award was initiated in 1982 by Dr. and Mrs. Edwin E. Vineyard in memory of their son, who had been employed by OETA prior to his death at age 25. The characteristics of the award recipient are based upon qualities which Louie saw in himself, and which he deemed a measure of his value to the organization. Because of his ability to relate to people of all ages in all phases of the operation, Louie saw himself as a mediator and go-between in interdivisional relations at the basic staff level. Also, with a gifted sense of humor, he attempted to make life on the job pleasurable for all those around him.